I'm not going to make any predictions for this fall. I made them last summer and I was proven wrong...more wrong than I could have imagined. I thought the season would start earlier than normal. It started later than ever. I thought it would be a long, salmon-filled fall, winter, and spring. Salmon were caught, both by myself, as well as by anglers I guided. However, we didn't catch as many as in previous years, mainly due to the extremely short season. Trips had to be moved or canceled. The low water delayed the opening of the season, then environmental disasters further shortened the fall season, as well as bringing it to a premature close. I'd like to think that all clouds have a silver lining. If the disasters that occurred on the river were the clouds, I'm hoping that increased scrutiny on all things river-related will be the silver lining. Maybe we had to go through this to make sure that the river won't be abused in the future. Despite the setbacks of last season, I am optimistic about this season. Cloud...this summer has been HOT. Silver lining...we've had a lot of rain and there is more in the forecast. Cloud...my son started kindergarten and I miss our weekday adventures. Silver lining...I have a lot more time to fish. I haven't taken advantage of it yet. I'm finishing up all the house-related work I put off over the summer so I'll have lots of time this fall. I'm relived to go back to being a weekday fisherman. I will be guiding on the lower Naugatuck River again this fall. Information can be found HERE. If this rain continues, we might be able to fish with two handed rods all season long. I think the last time that happened was back in 2011. 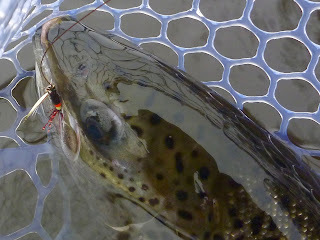 Some pools fish best in high water and some fish better in low water. I have spent a lot of time in the low water pools the past few years. Small flies, stripped by hand, were most successful. In average-to-high water, we can swing normal sized flies and, while the water is still warm, the salmon will rise to the surface to intercept them. I don't know how frequently I will be posting fishing reports here. Over the years, I have covered an awful lot about this fishery. 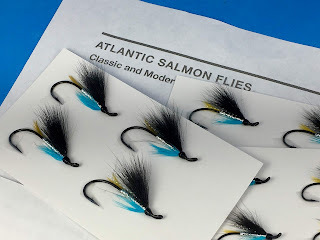 The archives are full of information, as is my ebook, Flies for Connecticut Atlantic Salmon: How to Tie and Fish Them. I'm not sure I have much more to write about. But maybe I will...I don't know yet. It should be an exciting fall season on the Naugatuck River. I'm going to get my tackle and flies ready this week. We might be salmon fishing within the next 2-4 weeks if all goes well. For more information, CONTACT ME. Otherwise, I will see you on the river this fall.